This is the first time I had ever stepped into Bob Roe’s. I have always heard great things about their pizza and wings and how helpful and nice the wait staff was (which I found to be true). I know that many Morningside students enjoy that Bob Roe’s is within walking distance of campus and that the prices are reasonable for how much food you receive. My first impressions were that it looked very much like any other sports bar/ hang out that I had been to and that it seemed very dark inside. Also the waitress was very kind and showed the group where we would be having our lunch. She took our drink orders in a timely fashion. 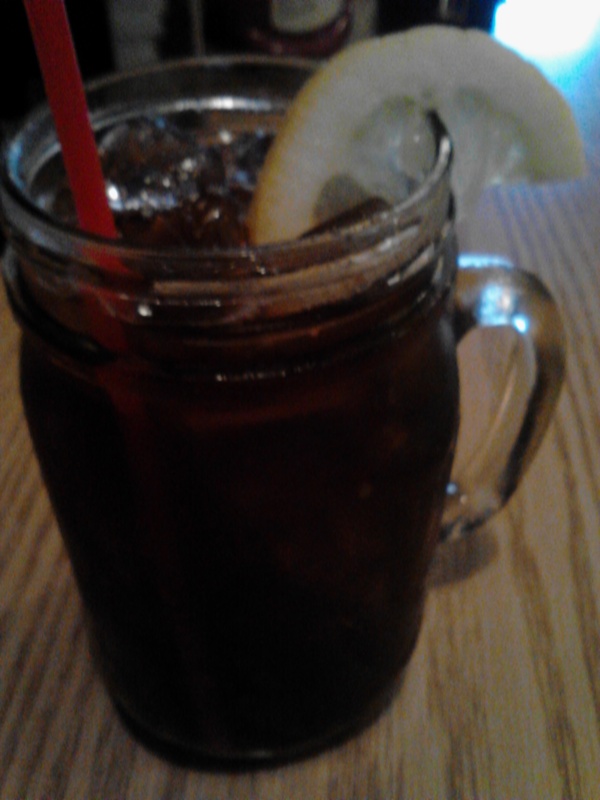 I ordered an ice tea and it came in the cutest little mug (see picture below). After everyone had arrived she allowed plenty of time for everyone to look through the menu and also informed the group of Monday’s specials. I had heard how the pizza and wings were so good, but I decided that Monday’s special sounded pretty good and interesting, a steak sandwich that was open faced with French fries, I had never heard of a steak sandwich before. When the food was delivered it was not at all what I had expected. The sandwich was more slice of bread with steak on top than I had imagined it would be, I guess what I expected was shaved steak on top of bread which is my fault for not asking questions. 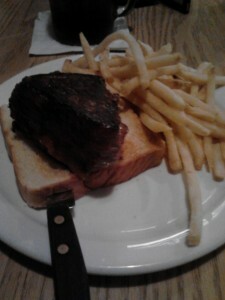 I had ordered mine as medium and it came out more well-done than I had hoped but it still tasted like a steak should. The steak had a piece of bacon wrapped around it, which no one should have any complaints about, and was seasoned nicely. For $7.75 I believe that I did, in fact, get my moneys worth out of the meal. It was very filling and the fries were awesome! And this post just wouldn’t be right if I did not say something about the plate presentation of the meal. The steak was to one side of the plate, the fries were on the other, and then there was a spot of bare plate, I am assuming for sauces or ketchup. Which is normal for any sandwich and fries meal. From what I could see the other steak sandwich plates looked very similar, if not identical. I found the knife sticking out of the bread to be a very neat idea: the waitress does not have to carry it, nobody is accidentally stabbing himself, herself, or others, and it looks pretty dang cool. A+ on that idea! I think that the fries were in a nice mound that wasn’t to high, the bread was a decent size, but the steak just looks out of place on top of the bread though. I found it pleasing see that most of the food was located within the inner circle of the plate, except a few fries here and there but that is to be expected with fries. All and all it was good to see consistency with the plates and the cleanliness of the plate was also appreciated. Overall, I would return to Bob Roe’s but I think I keep it safe and go with the pizza or wings next time. The menu had may different options and all different types of wing sauces and there were many different types of pizza, which I am excited to try on my next outing down there. I think that if it is your first time heading down that way keep to the wings and pizza. 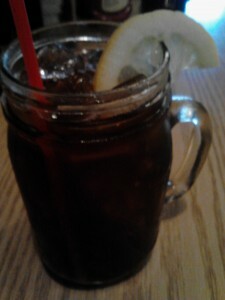 Accompanied by a beer or soda, in one of those adorable little mugs. This entry was posted in Uncategorized on May 14, 2013 by Daltynn.